Always like to be at Regina. Great location, great building. Nice and roomy apartments/studios. Good service! Reside in the heart of a house endowed with a soul, more than a century old, located in the heart of the basin of Arcachon. Every day, our teams take extra care to make your holidays rich with exchanges, encounters and discoveries. Only 800 m from the beach, in the elegant Ville d’Hiver district, this residence, built during France’s Second Empire, is a delight both in its architecture from another age as well as its leisure facilities. These include an outdoor swimming pool and a wooded garden. This is the place to relax between excursions, rambles or bike rides, a few moments spent on the beach watching the waves or mastering them in a kayak or in a sailing-boat. 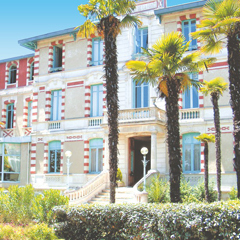 The Ville d’hiver was built on the heights of Arcachon in the 1860s for the benefit of wealthy aristocrats from all over Europe. The Villa Régina is perfectly in keeping with the extravagant style of the period. The pleasure of feeling at home in one's apartment, the joy of a change of scenery in this incredible building and this region so rich with possibilities of discovery and activities of all kinds. In the elegant district of the Winter Town, an authentic Second Empire mansion in the "Folle Époque" style with a garden planted with trees, 800 m from the beach. Fully renovated apartments! 66 apartments for your summer rental in Aquitaine, from studio flats to two-room apartments to accommodate 3-4 people, divided over three storeys with a lift. In Lège-Cap-Ferret, embark on board a flat, up to the oyster parks, admire the beauty of the landscapes, appreciate the work of the sea farmers, crab fishing around the parks... And enjoy on their breeding grounds this delicate and refined shellfish: the oyster. To fully enjoy the benefits of the Atlantic Ocean, spoil yourself with a thalassotherapy break* at the Thalazur thalassotherapy centre. Investigate the wide range of cures and treatments: massages, hydrotherapy, bio marine course, etc. Discover and visit the basin of Arcachon differently! Arcachon, on the Coast of Aquitaine, at the edge of the Forest of the Landes and not far from the vineyards of Bordeaux, is a family seaside resort. In the centre of France’s Atlantic coast, the Arcachon resort is the best place on the coast for visiting the region. The coastline of Acquitaine or Gascony is also known in French as the “Côte d'argent”, the silver coast. It stretches from the estuary of the Gironde to the Basque country, and has many natural treasures, beaches, pine forests, dunes, the ocean – so many beautiful features of the landscape are available for you to explore and recover your health during your summer rental in Aquitaine. Discover the town of Arcachon and its extravagant past, its grand, bourgeois architecture as well as its fine, sandy beaches, its oyster-beds, its walks, cycle paths, gastronomy, the surrounding fishing villages, its museums, and its bird island. Continue your journey to the largest sand dune in Europe, the dune du Pilat. Visit Cap Ferret and its brightly coloured houses. This is just the occasion for a boat trip to discover this delightful place and its famous lighthouse from which you can watch the entry points from the harbour to the open sea. Tour the fishing villages by bicycle. A magical excursion through the pine forests and pretty oyster villages of the basin. March: The feast of Arcachon. Patronal festival of the city on the day of the Annunciation: mass at the Basilica, procession on the pier of the Chapel, yrotechnic show and animation with bands. May: The beach to the Writers. Literary rendezvous where many well-known writers come to share their passion for words. The club’s Kiosk will tell you all you need to know about excursions, walks and unmissable events in the district. Every week, a guide will offer you excursions including the basin, the Teich bird sanctuary, the dune du Pilat, the Cap Ferret, Andernos, Gujan-Mestras, Bordeaux and its vineyards, and more (with or without a supplement). 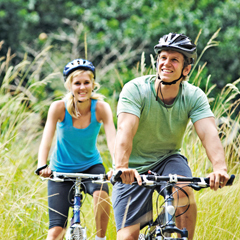 Cycle tours: the coastal path runs along the best sites with exceptional views over the basin. There are more than 500 kilometres of cycle routes throughout the Département of Gironde. Or choose the boat + cycle package! Rambling: With 2,000 km of marked hiking trails from the dune du Pilat to the tip of Cap Ferret, the Gironde can also be discovered on foot. The basin of Arcachon reveals its picturesque villages, oyster parks, forests and large sandy beaches. Beach and water sports: Boat trips on the peninsula of Cap Ferret or the Île aux Oiseaux and its chased huts, symbol of the basin of Arcachon, jet-skiing, kayaking at sea or on the Leyre, diving, sport fishing. Culture and discovery: From the City of Winter to the Source of the Abatilles through the auction of the port, go to discover the heritage of Arcachon. And also tennis, horseback riding, skydiving, golf (18 holes) and many other activities. One hour from Bordeaux via autoroute A63 then take the fast road A660. When entering Arcachon, make for the Office du Tourisme and turn left at the roundabout into the Avenue Gambetta which runs up to the Ville d’Hiver. At the top, turn right then take the third turning on the left. Bordeaux-Mérignac Airport, 65 km away. Seven days a week – from 8.00 a.m. to midday and from 3.00 p.m. to 7.00 p.m. RENTAL PACKAGE : Accommodation, TV, bed linen, towels and towels, maintenance kit, access to the swimming pool from May to September (depending on weather conditions). Options: Breakfast: 9,50€. End of stay cleaning: 49€/studio and 77€/2 rooms. Animals admitted: 8€/night. Comfort formula: beds made on arrival, change of towels and end of stay cleaning: the night = 12€/studio 18€/2pièces.